Pointed comments, laughter and recipes for people who love to cook and travel. Sometimes life can get very complicated and outsized. Power. Beauty. Politics. When all these conditions come together they can be life changing for some. Entire countries have been changed by such forces. I am not talking about Ms. Alaska runner-up and one time vice presidential candidate Sarah Palin. Or even the calculatingly attractive Ms. California, Carrie Prejean. Beautiful women born into tragedy. And certainly politically reaching with differing degrees of power. But their influence is so dimunitive really. True beauty and power comes from strength, elegance and simplicity. Something that can be very big. I learned of this beauty on a trip to Argentina learning about the primary force that has shaped this amazing South American country. I am not talking about Eva Peron (Evita), the larger than life "Queen of the people" that made something out of herself from nothing, putting an imprint on her people's psyche and becoming an international cultural symbol of Argentina. I am talking about the beauty, strength and elegance of Argentinian cooking - grilled beef with chimichurri sauce. This is food that means something. It's big and intense like the country it comes from. And full of flavor. It moves people. Evita was the illigitimate daughter of the mistress to a local aristocrat. Born in 1919, she spent the next 20 years living under the spector of this social taboo while taking all her talents to make something of herself. Her success in cinema and acting allowed her to bridge talent and opportunity together. Her life was one of power, accomplishment and tragedy. Although not a beauty queen, she was treated as royalty by the monarchs and institutions of Europe as Argentina's First Lady and one time populist vice-presidential nominee. By the time she died at age 33, she had ascended to be one of the most powerful political leaders in the country and an international icon. I have been very fortunate to have visited Argentina twice, both times staying in the nation's stunning capital, Buenos Aires. The capital, like the country, is a land of largess. The vast open spaces of the Patagonia. The ascending and spectacular Andes mountain range. And beautiful people - sometimes with outsized personalities (deservedly or not) of Italian and German ancestry. Argentines display a playful South American casualness wrapped around European elegance. Wide boulevards. Beautiful architecture. And then there is the food. Argentina is proud of its culinary heritage and it should be. Buttery and flaky empanadas, a nod to French baking with a twist of Latin American soul. Big and bold wines like the country's famous red Malbec from the vast and beautiful Mendoza wine country. Or my favorite export, the fabulously characteristic white wine Torrontes. Yet all of this doesn't really characterize what Argentina is. It is a country of beef. Although that sounds odd, it's true. Trust me when I tell you I love a good steak and I have had the opportunity to have some of the best in the world. I've tucked into Kobe beef bred from Wagyu cattle of Japan at $200 for a 10 oz filet in Tokyo. Each steer is fed a special diet, rubbed with sake and pampered with little allowable movement contributing to a soft and velvety experience. All in all not bad. The famous Tuscan T-Bone "bistecca alla fiorentina" of Val-de-Chiana? I ate it in Florence at Il Troia (Sostanza) , a restaurant whose influence only rivals the city's Renaissance Basilica di Santa Maria del Fiore. I would definitely go back for dinner here. But a simple and somewhat unexplainable fact remains. Argentine beef tastes better. Why? Some say the large open rich grass pastures of the Pampas allow the cattle to forage in a free range setting. Others believe the limited use of feedlots and antibiotics makes all the difference. I honestly can't say what is behind the phenomenon. But I can tell you that if I had three steaks in front of me: a kobe filet, a bistecca alla florentina T-Bone and an Argentine New York Strip, you would have to pry the Argentine steak from my cold dead hands. Asia? Sorry. Europe? No thanks. South America's beautiful and tragic Argentina wins hands down. All that said, the source of the beef matters when you are making your own. It's not terribly easy to get Argentine beef in the United States (but widely available in Holland - go figure). That said, you can create your own version with a good cut of New York Strip, filet mignon or skirt steak. If you go to Argentina you'll be going to an Argentine steak house, called a parilla, and ordering the Bife de Lomo, essentially a filet mignon. I am not a big fan of filets because while they are soft, they usually lack flavor. "Lomos", as they are called, literally rule. They are that good. They are "Evita big" in terms of taste and natural stature and they will change your perspective on what defines a steak. You'll order this with a glass of Malbec and then send me a nice email telling me how thankful you are that you read my little meat missive. For this recipe, I opted for free range, grass fed skirt steak. Simply seasoned with olive oil, salt and pepper and grilled for about 4 minutes and I am mentally in the fashionable Recoleta district having an oral Tango*. I am a big fan of Chimichurri sauce, a mix of parsley, garlic, chili pepper flakes and olive oil. Argentines put it on everything and it's excellent. 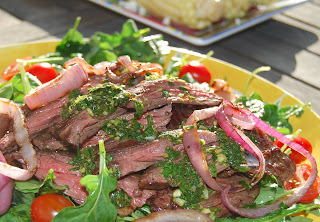 There is something about adding chimichurri to warm meat that imparts a scent like no other. I feel like I am back in Buenos Aires, sitting in a 100 year old cafe, with marble countertops and antique wood walls, having a 3 hour lunch. Although not necessarily Argentinian, I served my version over a bed of olive oil and sea salt seasoned arugula and cherry tomatoes. The warmth of the meat lightly cooks the vegetables with a drizzle of chimichurri on top. Big. Bold. Powerful. Simple. And beautiful. Not eating it would be a tragedy of beauty queen proportions. In a small food processor combine the parsley and garlic cloves. Pulse several times (10-15) to chop it coarsely. Alternatively, you can chop the parsley and garlic by hand. Place in small bowl. Add vinegar, salt, pepper, chili flakes and stir with the olive oil. Set aside. Heat a grill or grill pan over a medium flame. Rub olive oil on the bermuda onion slices and season both sides with salt and pepper. Grill over a medium to low heat for 5 minutes per side, flipping once, until soft and slightly golden. Remove onions to a platter. While the onion cooks rub steaks on both sides with olive oil, salt and pepper. Place steaks on a hot oiled barbeque or grill pan and cook no more than 2 minutes per side for skirt steak on a medium high flame for a total of 4 minutes, or 5 minutes per side for a New York Strip on a medium to medium high flame for a total of 10 minutes. Remove steaks from heat source to a platter. Cover with foil and let rest while you finish the remaining steps. On a serving platter, place arugula and drizzle with 2-3 Tbsp of good quality olive oil. Toss to coat and season with salt and pepper. Cut half of the cherry or grape tomatoes in half and scatter around the plate. Scatter remaining whole tomatoes on the plate. Toss with the arugula and then arrange for presentation. Slice the steak into strips crosswise with a diameter of 1/2 inch to 1 inch based on preference. Drizzle with some of the chimichurri sauce. Place grilled onions over the top of the platter and serve with the remaining chimichurri sauce on the side. * Normally this is eaten with a big red Malbec wine and it totally works. That said, it was close to 1oo degrees the day I made this. I served this with iced white sangria as I have blogged about here, but used an Argentinian Torrontes for the wine. It completely worked, balancing out the tanginess and spice of the chimichurri sauce. I am not a big fan of strictly doing red wine with meat and white wine with chicken or seafood. The white sangria worked well here. I really like Chmichurri sauce. Perfect match with the grilled skirt steak. Delicious! This is right up my alley! I was thinking of doing regular steaks tonight but you may have just changed my mind! Looks fabulous. I really need to get to South America. FYI: The word verification below is "grappa"! Random letters? Or kismet! That moves me, for sure. Thanks so much for your last comment! I so appreciate any word-of-mouth press...especially from a foodie like you! Your skirt steak looks amazingly delicious by the way! I've always wanted to visit Argentina. My hubby, aka Meat Boy, would totally dig the carnivore tendencies there. In this economy, don't think we'll make it there anytime soon. But I can at least swoon over this grilled skirt steak, and imagine I'm there. Hi Marc! I am lusting over the Sauce- skirt steak, I might have to scour Tokyo--- The dish looks Delish, I have not had "steak" in truly, a very long time. What a beautiful dish! I'll be making this very soon - it looks too good not to! I love steak...and with the chimichurri sauce, cannot go wrong...it looks so delicious. By the way, thank you so much for visiting my site. Let's just cut the crap...can you come and cook for me...pretty please? Excellent post. I have eaten many a steak from many different locales, but alas, never Argentinian. Now it is on my list, and skirt steak is one of my favorites. I must make your chimichurri. My college room mate was from Argentina, we shared many Yerba mates, and sometimes only had chimichurri on microwaved potatoes for dinner!He made the skirt steak occasionally when we had extra money to splurge. Your whole setting though has much more pizazz! Hat steak dinner looks nice and light and fresh and good! Argentina has the highest per capita meat consumption in the world. Many gauchos have eaten beef for breakfast, lunch and dinner since they were children. You can envy them, Walter Glaser reports, because when you get a good steak in Argentina, it is the best on earth. I stayed in various apartments in Buenos Aires while I was there and not once was I able to cook a steak like the one it is served on the restaurants. It must be something you have to be born with! I view the world through food with an excitement for learning about different regional cultures in the United States and around the world. Visiting 30 countries has fed my passions for writing, cooking and photography. And I simply love talking about it. All writing and photography on Chefectomy is Copyright Marc Winitz © 2008 unless indicated otherwise. All rights reserved.